GALION — Sunday’s cemetery walk at Fairview Cemetery will celebrate the accomplishments of individuals who have been involved with the Galion Red Cross since its inception on June 2, 1917. The walk celebrates the 100th anniversary of the organization operating in Galion. To that end, Nancy Green will portray Pat Wittibslager and Cathy Moneysmith will portray Margaret Murphy. The two were long-time Red Cross executive directors in Galion. Also on Sunday, Kopp Crypt will be open at the cemetery and Galion’s Mike Mateer will be on hand to share information about some of his relatives buried there. During the cemetery walk, donations will be accepted and will go toward future programs. Parking is limited at the cemetery, so if you can carpool, that will help the situation. Also, use the south entrance of the cemetery. 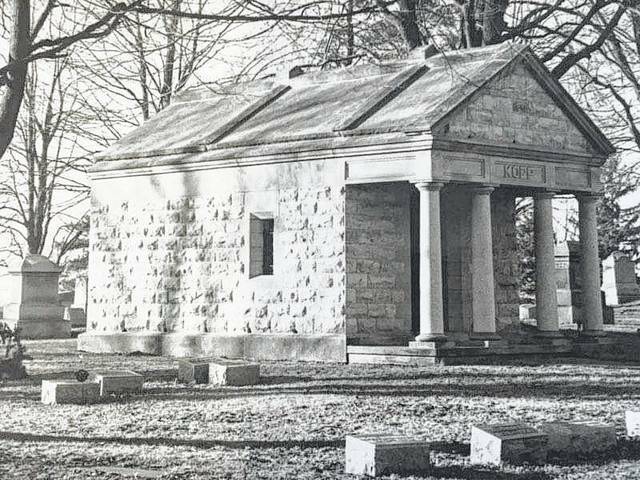 Courtesy photo| Galion Historical Society Kopp Crypt will be open during Sunday afternoon’s cemetery walk at Fairview Cemetery. Galion’s Mike Mateer will be on hand to share information about some of his relatives buried there. http://aimmedianetwork.com/wp-content/uploads/sites/38/2017/06/web1_Koppe-Crypt-at-Fairview-Cemetery.jpgCourtesy photo| Galion Historical Society Kopp Crypt will be open during Sunday afternoon’s cemetery walk at Fairview Cemetery. Galion’s Mike Mateer will be on hand to share information about some of his relatives buried there.